Jim Bridenstine NOAA funding bill: Investing more in tornado research would be a disaster. An approaching tornado on May 20, 2013, in Moore, Okla.
You’d think a meteorologist like me would be thrilled at the idea. According to the Washington Post, this is the first major weather-related bill to pass the House since 1992. And it’s certainly timely: Tornado season has just begun, and according to the Weather Channel, today might see the biggest outbreak since November 2013. But the devil, as always, is in the detail. If the bill eventually becomes law, it would change weather and climate research for years to come, and not necessarily for the better. While it’s necessary to continue making progress on hurricane and tornado forecasts, it should definitely not be at the expense of funding to improve forecasts of lower-profile weather and climate disasters that, in aggregate, kill dozens of times more people per year, and are increasing. Essentially, the bill, which was approved by a voice vote on Tuesday, invests scarce funds in high-profile weather events at the expense of those that cause many more deaths. Boosted by human-caused climate change, heat waves now kill more people in the United States each year than hurricanes, tornadoes, lightning and floods combined, according to the CDC. And weather-related traffic accidents kill 10 times more than heat waves—more than 6,000 people per year. The proposed legislation, the “Weather Forecasting Improvement Act of 2014” (HR 2413), could have been even worse. The bill was put forth by Rep. Jim Bridenstine, R-Okla., and later amended by his Democratic colleagues to blunt what initially amounted to a bait-and-switch effort to defund federal climate change activities. In the House-passed version, it’s still unclear where the estimated $356 million of tornado and hurricane research money the legislation mandates will come from. Possibly for this reason, Senate prospects for the bill are uncertain. In a speech on the House floor last summer, Bridenstine demanded that President Obama apologize to his state for funding climate change research over tornadoes. This legislation amounts to his attempt to force the issue. During the same remarks, he claimed that “global temperature changes, when they exist, correlate with sun output and ocean cycles,” flying in the face of a consensus of more than 99 percent of climate scientists who say human activity, led by fossil fuel emissions are changing the planet’s atmosphere. A rethink of American weather and climate forecasting is sorely needed, don’t get me wrong. After Hurricane Sandy, U.S. weather forecasting capabilities were called into serious question when European computer models anticipated the storm’s left hook into New Jersey about four days sooner than its U.S. counterparts. This legislation aims to close that long-standing forecast gap by investing in supercomputing power and advanced radar, among other efforts. That’s a worthy cause. But it’s counter-productive to be putting more money into tornadoes and hurricanes when it comes at the expense of stopping the real killers. Deaths from tornadoes are on a long-term decline in the United States, even as heat-related fatalities appear to have risen. (It’s difficult to say for sure, since in the late ‘90s the World Health Organization changed the way it classifies causes of death. )* Your chances of dying in a tornado are now less than one in a million, which is one-tenth of what they were than before the advent of weather radar. Recently, the country’s weather radar network was further upgraded to allow “dual polarization,” which, among other life-saving features, allows meteorologists to directly detect tornado debris for the first time. As a result, average tornado warning times have increased remarkably over the past decades, from essentially zero to now about 15 minutes. This bill aims to increase that to one hour, in part by again upgrading radar technology. But focusing on technology overlooks the real source of the tornado problem: poverty. Tornadoes disproportionately kill people in flimsy mobile homes, with or without better warnings. Meteorologists are starting to experiment with the language of the warnings themselves, in an effort to better prevent “warning fatigue” and highlight which storms pose a particularly outsized threat. 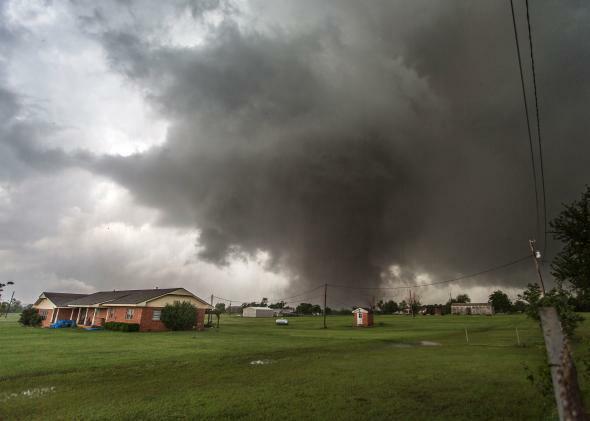 Researchers are also getting better at forecasting the general large-scale patterns that make severe weather formation more likely, with the Storm Prediction Center—the nation’s foremost tornado experts—now issuing convective outlooks up to eight days in advance. 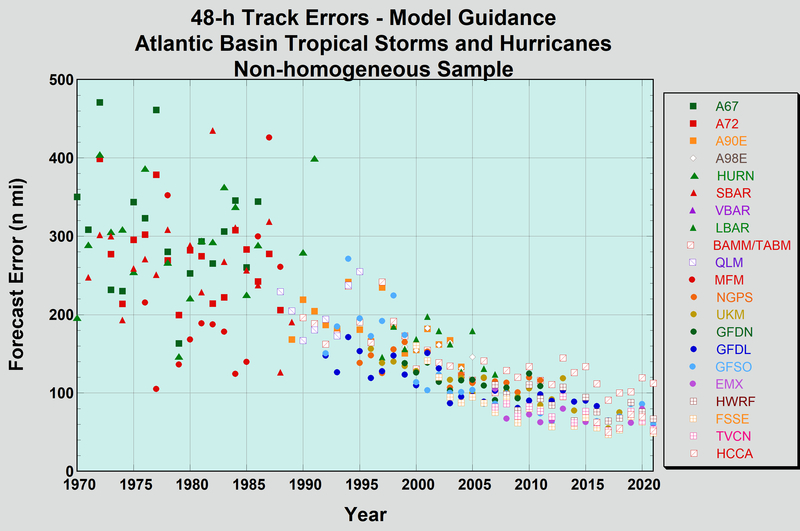 Hurricane forecasts have made similarly impressive strides, with two-day track errors decreasing by one-third over just the last 20 years. That time goes much further now in an age of perma-connectedness: Thanks to texts and social media, news of an impending storm travels quickly. But people are often left behind. In a given year, New York City experiences more deaths caused by heat (about 15) than Oklahoma does from tornadoes (about 5). Why don’t we talk about this more? Perhaps because it’s hidden. Those who die from heat exposure are often elderly, and do so in their own homes. That means it’s hard to calculate just how big of a problem heat is becoming. For example, the huge European heat wave of 2003 killed between 30,000 and 70,000—no one’s quite sure. When weather-related deaths happen in ones and twos and don’t make the front page of the paper, it’s easy to underestimate their impact. 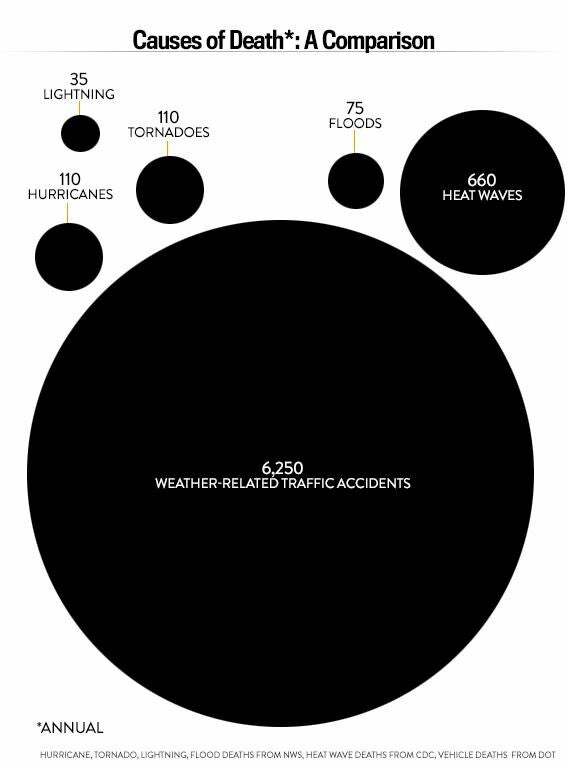 Which brings us back to the biggest weather killer in America: your car. As vehicles become more and more automated, they’ll soon be able to transmit weather data in real-time to warn the car behind them of slick spots or fog. Turn on your wipers? Chances are it’s raining. Did your anti-lock brakes engage? The car behind you should probably start to slow down. Now, that’s where I’d like to see my tax money go. *Correction, April 3, 2014: This post originally stated that heat-related fatalities have tripled in the last few decades. However, in the late ‘90s, the World Health Organization changed the way it classifies causes of death, making it difficult to compare data. *Update, April 4, 2014: This graph in this post has been updated so that the circles showing annual weather-related deaths are to scale.